I am definitely a fan of this series, but I have to say I was surprised when I realized who the hero of this story would be. We first met Brynmor in A Feast of Souls, and to call him an unlikely hero would be an understatement. He bought his wife. He killed her lover and ate his heart. He gave her child away. Oh, and he’s dead. (Did I mention he’s dead?) And sharing the body of a wolf with the animal’s permission. Kind of hard to envision a happily ever after there. Daraja is on a quest in the woods to seek her future when Brynmor’s pack mistakenly believes she has killed one of their own. Brynmor is taken with her and wants to help her prove her innocence to the animals who want her dead. 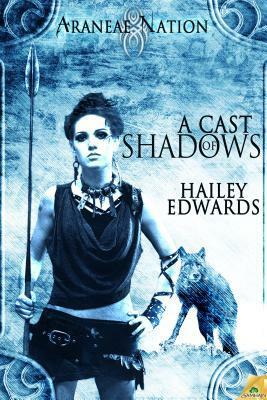 He presents himself as a normal man tasked with caring for the wolves, and an attraction begins building between them. But it’s only a matter of time before the truth of his situation comes out. I won’t get into more detail because I don’t want to give the story away. I will say that there were parts of the book that I enjoyed. I really like this world, though we only see it in a limited context in this novella. It’s interesting to see Brynmor evolve and finally let go of all the hurt and leftover angst from his previous life. And there is a surprising amount of sexual tension going on for a dead guy who sometimes shares a body with a big dog. Overall, it wasn’t quite the hit for me that the two full length novels were, mostly because of the nature of Brynmor’s existence. But it was still an enjoyable read.